Originally a palatial private home, the first reference to a gambling raid at 8477 Sunset came in October 1929, when Clyde Plummer- formerly the incorruptible head of the LAPD’s vice squad, now head of District Attorney Buron Fitt’s prohibition enforcement unit- found an illegal craps game running here. When Plummer again raided the joint for gambling again in February 1930, it was calling itself the Sphinx Club. Among those arrested was “Frank Harris,” alias George Goldie, brother of gambler Bob “Goldie” Goldenberg. As of March 1933 it was operating as Club Sokoloeff and again raided by sheriff’s deputies- this time for liquor violations. In August 1933, it was the “Hahn Club” according to a city permit to make some alterations to the building, Nola Hahn being another gambler associated with 8477. Soon after this it adopted the name by which this address is most famously associated: the Clover Club. 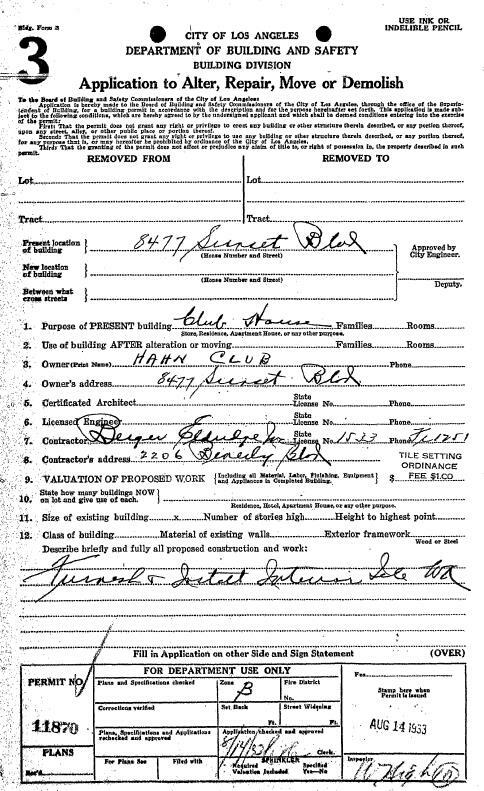 City of Los Angeles building permit for alterations to 8477 Sunset Blvd., the “Hahn Club,” soon to be renamed the Clover Club. 8-14-1933. Eddie Nealis was among those arrested at the Clover Club in the wee hours of January 28, 1934 in a raid by Sheriff’s vice squad deputies, who dressed in tuxedos in order to blend in with other patrons (1). Bob Goldie still held a large share in the Clover Club at the time of his death in November 1935. Other asserted partners in the club according to a lawsuit brought by Goldie’s widow over the estate included Nealis, Milton “Farmer” Page, Guy McAfee, and Tutor Scherer, who had operated gambling clubs around Los Angeles during the Prohibition era. A 1941 lawsuit against producer Joe Schenck also identified Al and Lou Wertheimer, formerly of Detroit’s Purple Gang, as having been partners in 1935-36 (2). Capt. 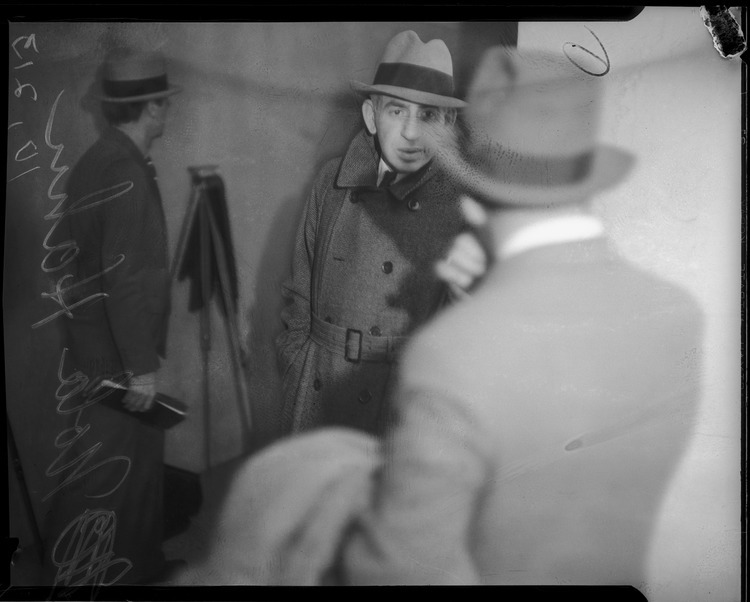 George Contreras (right) of the sheriff’s vice squad, dressed in a tuxedo to conduct a raid on the Clover Club and two other swank Sunset Strip area gambling joints, January 29, 1934. 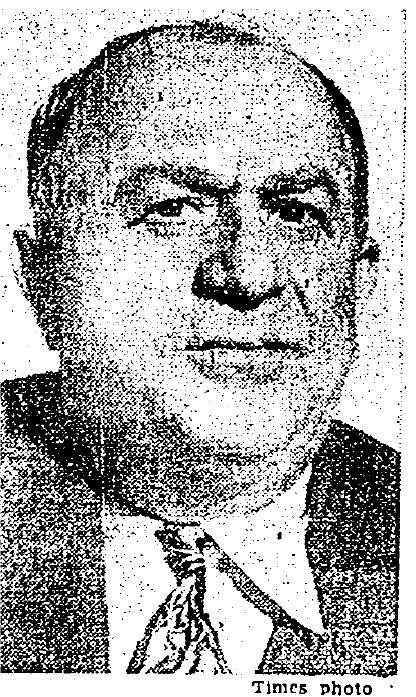 Contreras was once head of District Attorney Asa Keyes’ “booze squad” during Prohibition. At left is Capt. Hunter. LAPL. Another nightspot notorious for its association with illegal gambling, the Club Continental (formerly Airport Gardens) in Glendale, under the “same management as the Clover Club.” 1-24-1935. Frankie Masters and Marcel Lamaze hosted a party for Alice Faye at the Clover Club a couple weeks after this. On the surface, the Clover Club operated much like any other upscale Hollywood nightclub, with dining and dancing, roving photographers, even brawls. The illegal gambling rooms were hidden, with access granted to those in the know- which included many of Hollywood’s elite. Despite numerous raids and loss of license due to gambling activity, there doesn’t seem to be any stigma attached to the club, as Society and Hollywood gossip columns of the period are full of perfectly respectable events being hosted there. 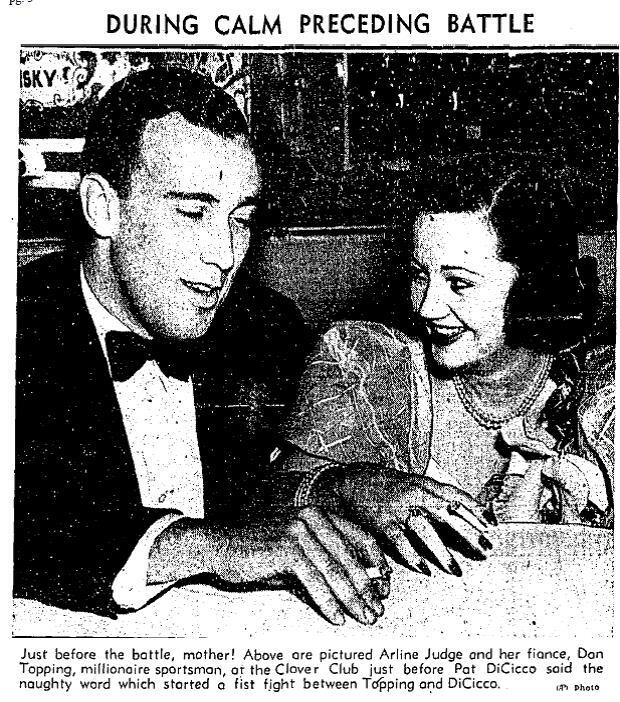 Arline Judge and Bob Topping at the Clover Club, February 21, 1937. 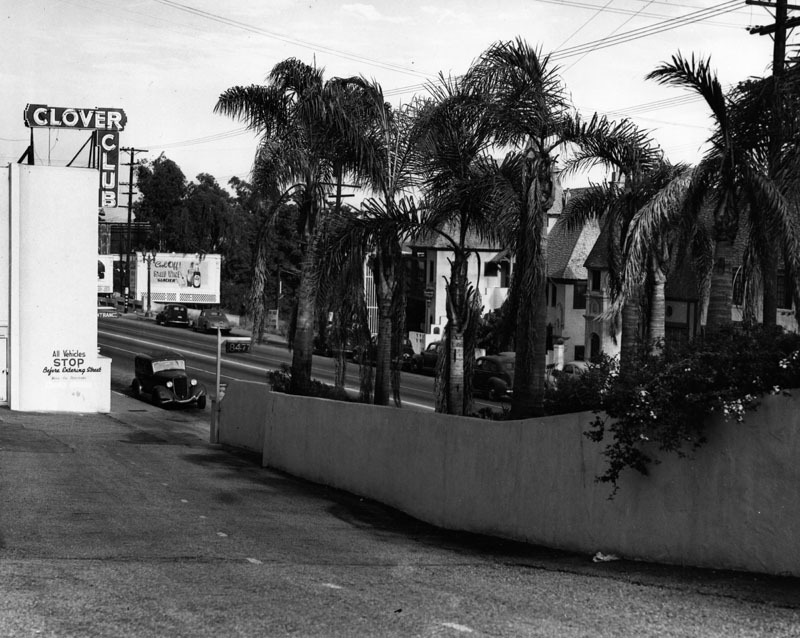 The Clover Club had roving photogs and brawls just like any other popular Sunset Strip nightclub. It had just been raided 3 weeks before. 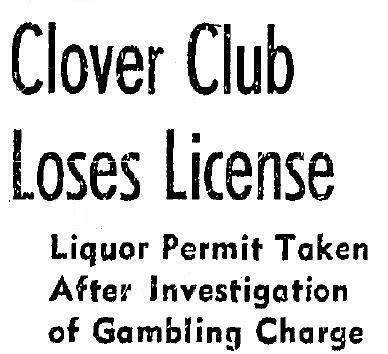 In January 1936, the State Board of Equalization (SBE), which, since Prohibition’s end regulated liquor at the State level, pulled the Clover Club’s license over its gambling activity. The operators accused the SBE of soliciting bribes. 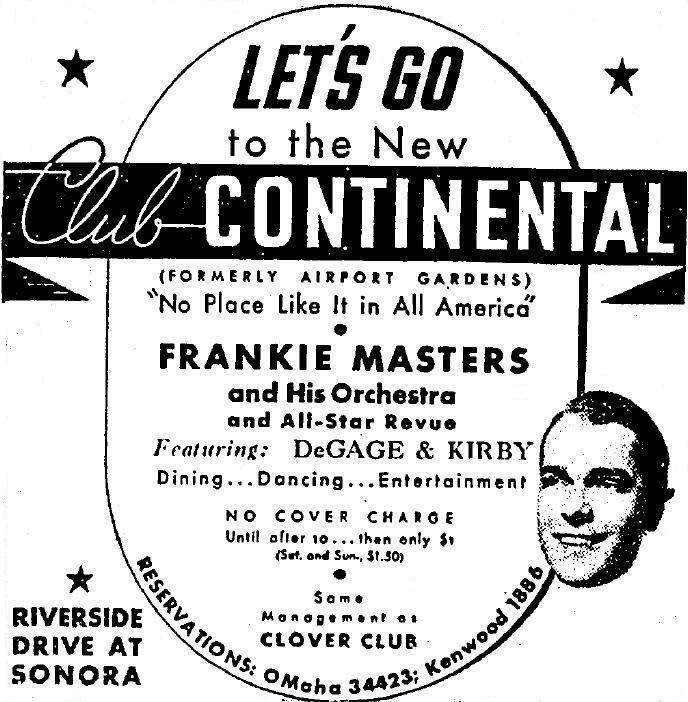 In any case, the club was back in business by June 1936. That month, while claiming 8477 to be a residence, a “Moe Lewis” applied for a permit to make alterations to the property. 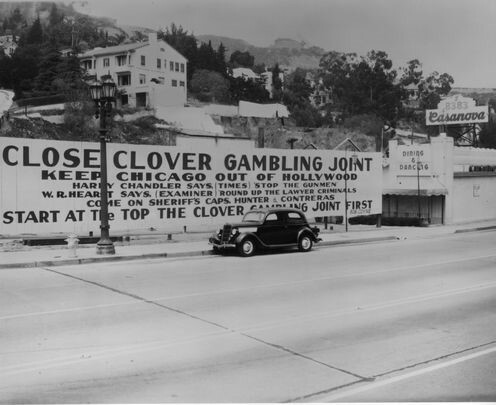 In February 1937 the Clover Club’s gambling rooms were raided by sheriff’s deputies. In August its license was again suspended by the SPE for gambling violations but was back in business by December when agent Vic Orsatti threw a bon voyage party there for star of the ice and screen, Sonja Henie. 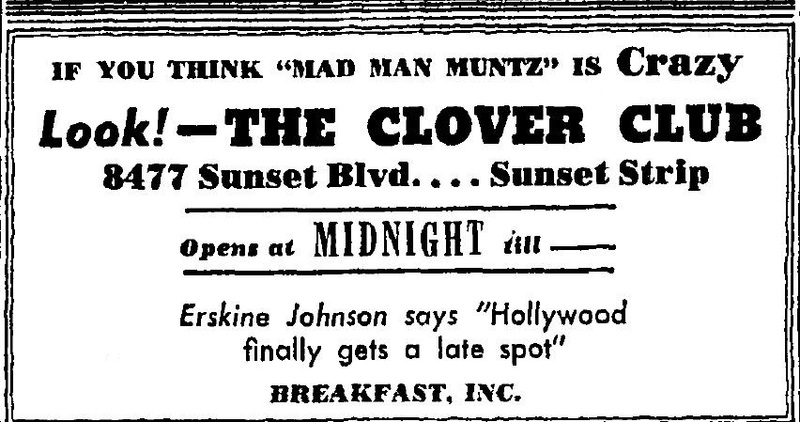 In February 1938 a State Assembly Committee vowed to probe conditions in the “so-called county strip centering on Sunset Boulevard,” but were unable to serve subpoenas on any of the Clover Club’s owners or operators. The club did, however, lose its license again on November 16, 1938 due to gambling infractions. “Keep Chicago out of Hollywood- Close Clover Club Gambling Joint.” Anti-gambling signs on a vacant lot owned by the Coyne family, adjacent to the Casanova Club, 8383 Sunset Blvd, c. 1837-1938. Similar signs located on vacant lots at 8381 and 8373 Sunset Blvd. mysteriously caught fire in the wee hours of August 27, 1933. LAPL. 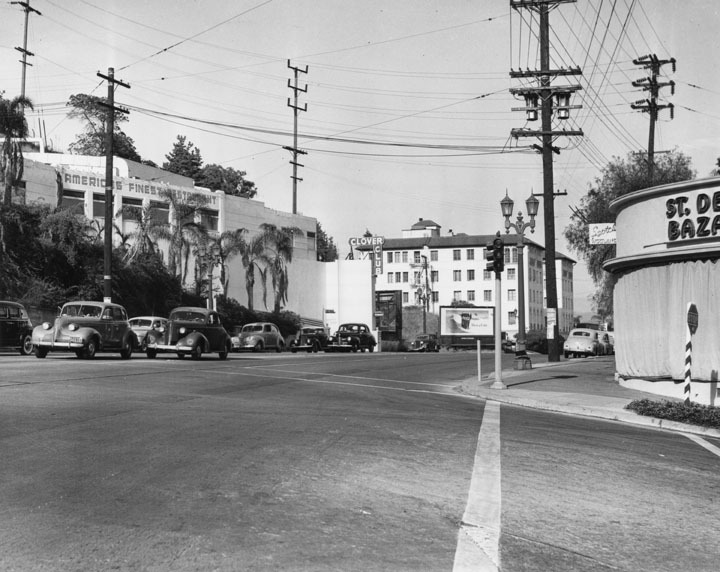 The Clover Club seen from the intersection of La Cienega c. 1939. LAPL. In June 1939, the Los Angeles Times reported that the “big shot” gamblers of Los Angeles were leaving town, noting that the Clover Club had been closed “for months.” Eddie Nealis was said to be in San Francisco, Farmer Page on a gambling ship, and Guy McAfee operating a night club in Las Vegas. Some sources attributed the exodus to the reform policies of new Mayor Fletcher Bowron, elected in September 1938 after his predecessor Frank Shaw was recalled from office. County D.A. Buron Fitts, however, hinted that a “well know figure” was squeezing local gamblers out and establishing a dictatorship over gambling. Sure enough, on March 24, 1940 sheriff’s deputies, led again by Capt. 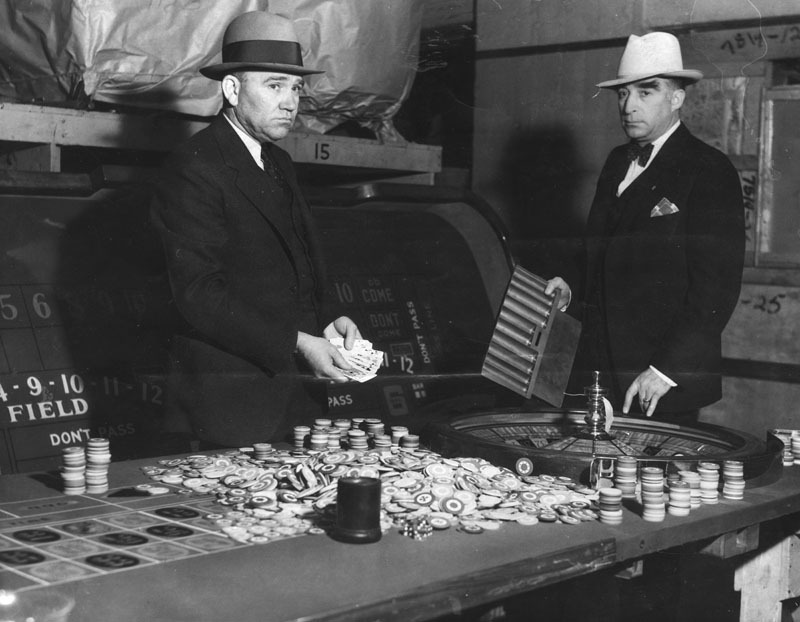 George Contreras, with Deputy Charles Rittenhouse and others, raided the skating-rink-sized gambling rooms secreted within the Clover Club premises, seizing equipment, cash and the names of many “Hollywood notables” (3). On September 15, 1943, 8477 reopened as the Marcel Lamaze Club. Lamaze was also affiliated with Ciro’s just down the street at 8433 Sunset. 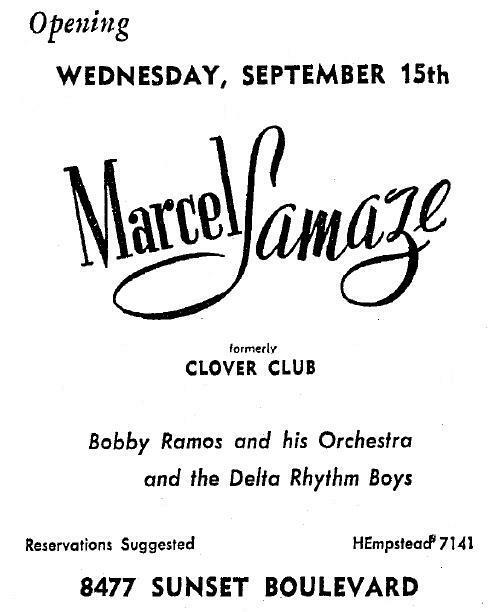 By October 1943 it was advertising as the “Marcel Lamaze Clover Club.” Soon, however, it was back to being just the “Clover Club” again. With its famous name restored, the Clover Club began hosting Sunday Night Guest Parties, honoring a different Hollywood celeb each week, to compete with the Trocadero’s Sunday Talent Nights. In December 1944, the Clover Club, along with the Trocadero, Mocambo, Ciro’s, and other Sunset Strip nightspots, had its license suspended by the SBE for violating the wartime midnight closing hour curfew. 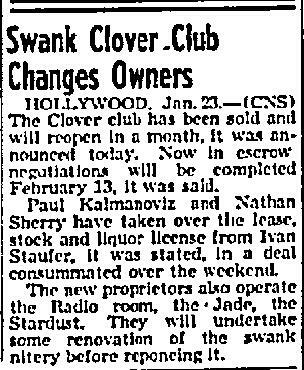 In January 1945, The Long Beach Independent reported that the Clover Club’s lease, stock & liquor license had been sold by asserted owner Ivan Staufer to restaurateurs Paul Kalmanoviz and Nathan Sherry, who would later be part-owner in a namesake cafe at 9039 Sunset (4). On April 3, 1945, 8477 Sunset reopened as “Jerry’s Joynt Hollywood” (5). But by summer had reverted to the famous Clover Club name once again. It seems to have closed once again, however, as advertising of Aug 31, 1946 refers to a “reopening” September 6, 1946. On October 6, 1946 it was raided for gambling. Manager “Robert Rubin” and several other employees were arrested. 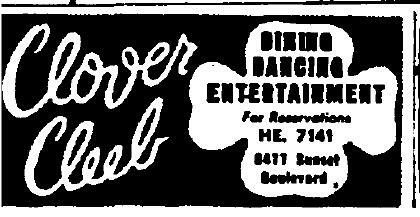 The Clover Club reopens, September 1946. Man Man Muntz was a flamboyant local car salesman noted at the time for his radio spots and billboards. For a time, he operated out of 8363 Sunset. 9-14-1946. 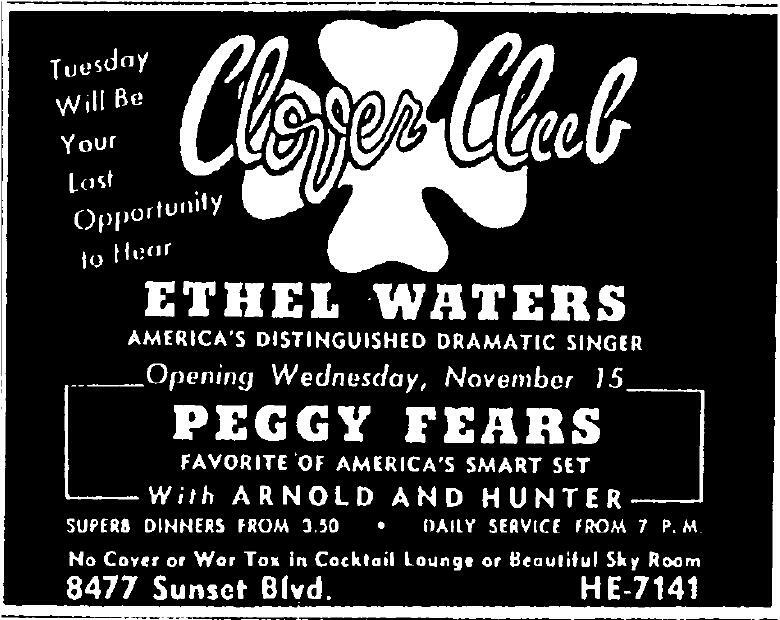 An ad dated October 19, 1946 says “Rumors are flying but the Clover Club is open as usual.” “Rumors Are Flying” was the name of a popular song at the time, but no doubt the Strip was buzzing about the raid. It is the last ad found for the Clover Club as part of this research. 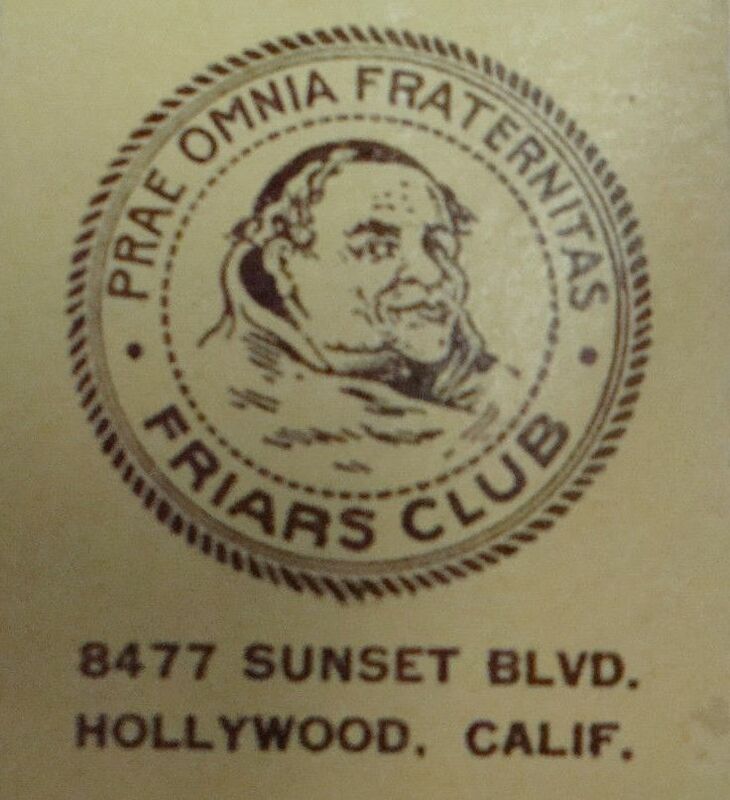 As of March 1947, 8477 had become the temporary clubhouse for the new Hollywood Friars Club. 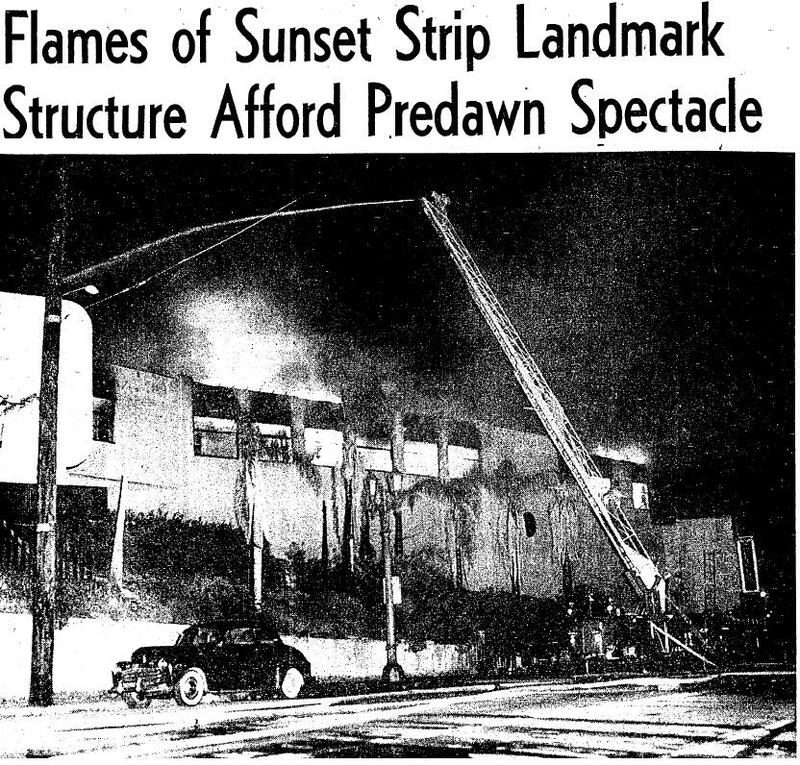 The building was operating as the Army & Navy Officer’s Club when it burned down, January 28, 1952. 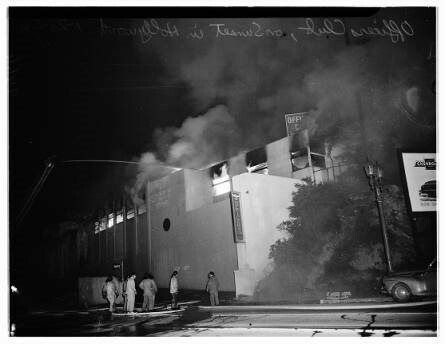 Fire at 8477, January 1952. UCLA. This history of the 8477 Sunset Blvd. is derived from original research, based on historical newspaper and magazine articles, city building permits, city directories, legal documents, census records, and other public records. (1) See Los Angeles Times 1-29-1934 and 1-30-1934. (2) See Los Angeles Times 5-22-1936 and 8-7-1936, 3-14-1941 and 3-19-1941. Scherer ‘s 1956 book of poetry also makes note of his affiliation. It’s asserted today that Bugsy Siegel also owned a part of the club. When police arrested Siegel at his home in 1940, they did find cancelled checks in his safe made out to Farmer Page for $1000 and Eddie Nealis for $4000 but it was not known what the checks were for. Note that in Los Angeles and Hollywood, when “ownership” of a property generally meant ownership of a lease to operate a property, not the land on which it stood. Leases changed hands often; land seldom did. Given that partnerships in ventures like nightclubs also tended to be held by corporations, generally using fronts, determining actual ownership of a property is difficult. (3) In 1940, Contreras was accused of having gambling interests and soliciting bribes. He was exonerated in both cases, but before the year was out, Contreras was removed as head of the vice squad in the wake of the public outcry over the news that Bugsy Siegel had been allowed to make outside “excursions” while being held in County Jail for suspicion of murder. In 1941 Rittenhouse was arrested on 61 counts of bribery, when bookmaker John Osborne alleged that he and others had paid “protection” money to Rittenhouse and Eddie Nealis from 1938 to 1939. The case eventually ended in acquittal, although, inexplicably, Rittenhouse’s brother was found guilty of bribing a witness in the case. (4) Court documents from a May 1958 tax lawsuit involving the now-late Nathan Sherry’s heirs reveal that Sherry retained the Clover Club property after his partnership with Kalmanoviz was terminated in 1947, and further notes that Sherry;s ownership included not only the Clover Club building but the real property it stood on. He sold the property after the building burned down in 1952. (5) At the time, Sherry and Kalmanoviz also had an interest in Jerry’s Joynt Wishire at Wilshire Blvd. & San Vicente. Pingback: ODYSSEY OF LOVE– STEP BEHIND MY SCREEN OF STORIES. THE inner voice where gaps of expression are liberated.